Paul Sperry, author of the new book, Infiltration, in an interview calls Grover Norquist "an agent of influence for Islamists in Washington." When asked by FrontPageMag.com why a Republican anti-tax lobbyist should so passionately promote Islamist causes, Sperry implied that Norquist has converted to Islam: "He's marrying a Muslim, and when I asked Norquist if he himself has converted to Islam, he brushed the question off as too 'personal.'" As Lawrence Auster comments on this exchange, "Clearly, if Norquist hadn't converted to Islam, or weren't in the process of doing so, he would simply have answered no." 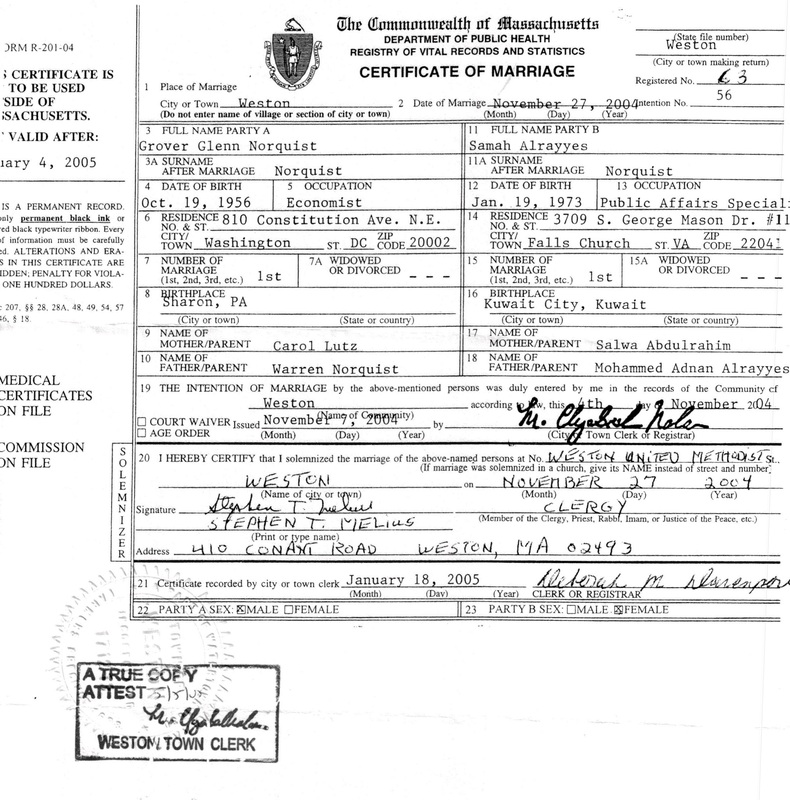 Indeed, Norquist married Samah Alrayyes, a Palestinian Muslim, on November 27, 2004. On the one hand, Islamic law limits a Muslim woman to marrying a man who is Muslim; this is not an abstract dictum but a very serious imperative, with many "honor" killings having resulted from a woman ignoring her family's wishes. On the other hand, they were married in a church by the Rev. Stephen T. Melius of Weston United Methodist Church in Weston, Massachusetts. Alrayyes (now known as Samah Alrayyes Norquist) has radical Islamic credentials of her own; she served as communications director at the Islamic Free Market Institute, the Islamist organization Norquist helped found. Now, she is employed as a public affairs officer at the U.S. Agency for International Development – and so it appears that yet another Islamist finds employment in a branch of the U.S. government. 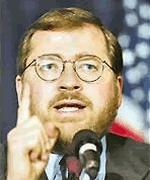 Grover Norquist has for some years now been promoting Islamist organizations (though less of late), including even the Council on American-Islamic Relations; for example, he spoke at CAIR's conference, "A Better America in a Better World" on Oct. 5, 2004. Frank J. Gaffney, Jr. has researched Norquist's ties to Islamists in his exhaustive, careful, and convincing 2003 study, "﻿A Troubling Influence." He concludes that Norquist is enabling "a political influence operation to advance the causes of radical Islamists, and targeted most particularly at the Bush Administration." the Public Affairs Specialist for Arab and Muslim outreach at the Bureau of Legislative and Public affairs at USAID. In her position, she works on developing and implementing communications and public affairs planning with regard to various Muslim and Arab outreach issues including USAID activities in Iraq, Afghanistan, Middle and Near East and many parts of the Muslim world where AID is present. This includes serving as a liaison with Muslim and Arab American interest groups to brief them on USAID activities in the developing world and coordination of the Agency's participation in events, conferences, and discussions designed to educate the publics about American foreign assistance. In addition, Norquist attends interagency meetings representing USAID on issues related to Arab and Muslim outreach and public diplomacy. Also, in an earlier job, "she was cultural affairs assistant at the U.S. Embassy in Amman, Jordan, where she was responsible for cultural exchange programs between the United States and Jordan." Nov 11, 2008 update: Grover and Samah have adopted an 8-month-old baby girl from Bethlehem and named her Grace. June 9, 2011 update: Speaking of non-Muslim men prominent in American politics who marry Muslim women, did Anthony Weiner, born Jewish, convert to Islam to marry Huma Abedin, a Muslim of South Asian origins? According to one account, he has accommodated his pious wife by "giving up drinking and even occasionally fasting in Ramadan." 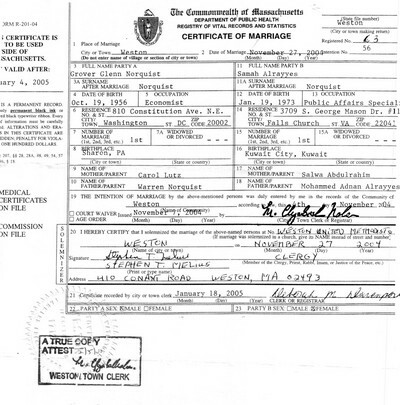 Ben Barrack marshalls evidence to suggest that he did at "Did Weiner Secretly Convert to Islam to Marry a Muslim?" June 21, 2011 update: For an extended analysis of this topic, see this interview of Robert Spencer, "Abedin/Weiner: A Marriage Made by Hillary Clinton and the Muslim Brotherhood?" First, Grover Norquist is an advocate for legitimating Shariah Compliant Finance as an ethical alternative to capitalism. And second, Norquist's chosen battle ground for this subversive effort has been and remains the chiefly influence- and lobby-based contracts drawn up through USAID. Mar. 4, 2014 update: Ryan Mauro finds today that the evidence "suggests that Norquist's passion [for Islamist causes] was triggered by a personal conversion to Islam. His wife, Samah, is a devout Muslim. In 2008, they adopted a Palestinian baby from Bethlehem." What has not been reported until now are Norquist's other family ties to pro-Hamas Palestinian activism, including the previously unknown relationship with a man named Majed Tomeh who has been married to Norquist's sister Loraine for decades and who was a co-founder of Norquist's Islamic Institute. Majed Tomeh is a long-time Palestinian activist. In the 1980s, when he attended Harvard Business School, Tomeh was the coordinator of the American Arab Anti-Discrimination Committee in Boston … you'll remember that this is same ADC that Khaled Saffuri was the national development director of in the same time period. Why has Majed Tomeh never been mentioned by Grover Norquist as a co-founder of the Islamic Institute? Majed and Loraine's daughter Alina Tomeh has continued the family tradition of Palestinian activism; she's listed as President/Chairperson with Students for Justice in Palestine at Smith College in Northampton, Massachusetts. On Samah's side, both of Norquist wife's sisters Sahar and Sarqh, who live in Chicago, are Palestinian activists who have taken numerous trips to Gaza and the West Bank, connected with the group Palestine Children's Relief Fund (PCRF). Sahar, a dentist, is also the treasurer of the Chicago chapter of the PCRF. Comment: Norquist's deep ties to the Islamists, and perhaps being one himself, now fits into a larger context. Feb. 19, 2015 update: The Stranahan research is having an impact on Norquist's prized membership on the board of the National Rifle Association, reports Matthew Boyle at Breitbart. In a letter to fellow NRA board members, Norquist argued that the issue of his ties to Islamists has "risen to a new level" because "one of [Frank] Gaffney's folks has sent out my wife and daughters pictures on twitter," a reference to the Stranahan article. One of the "benefits" of achieving some success in fighting for liberty in the city of Washington D.C. is that some people come to believe you can do anything. Sadly this includes some sad individuals who convince themselves that you are responsible for their personal failings. I have such a stalker whose conspiracy theory is that I ran the Bush White House and presidency. And that I used my superpowers to one single end. To keep him (Frank Gaffney) from being employed in the Bush Defense Department and from being recognized as this generation's Winston Churchill. Norquist accused Gaffney of spinning conspiracy theories about his being gay, Muslim and "responsible for the Bush foreign policy failures." Norquist denied all three: "No. No. and No." Grover Norquist has served as an agent of influence for assorted Islamic supremacists since 1998 when he began taking at least $20,000 in seed money from a top Muslim Brotherhood operative and al Qaeda financier named Abdurahman Alamoudi to start the Islamic Free Market Institute. The Institute's transparent purpose was to afford Alamoudi and his fellow jihadists a vehicle for penetrating and subverting the conservative movement and Republican Party. The good news is that Alamoudi was subsequently arrested, tried, convicted and sentenced to 23 years in federal prison on terrorism charges," Gaffney wrote. "The bad news is that Mr. Norquist has continued to use his various organizations and affiliations — including his membership on the board of the National Rifle Association — to deflect attention from such facts, pretend they do not exist or mislead the unwitting about them. You tell me you think this guy is a good person to have around. He's not. He's not. And I will just say this, I don't know his motivation. I'm not saying he's trying to destroy the United States. My guess is he likes power and money. That's it. There's a lot of money in the Middle East, all you have to do is play footsie. And we'll be fine. And stop being so panicky and little girl. That's what's happening. He's choosing to turn a blind eye. I don't think he's Muslim. I'll just tell you this, his answers make no sense. None. Apr. 2, 2015 update: Ryan Mauro of the Clarion Project obtained White House documents showing that, ironically, George W. Bush was to meet with Islamists, many linked to Norquist, on the afternoon of September 11, 2001, after his return from Florida. For details, with a full list of who he was to meet with and their connections to Norquist, see "Bush was to Meet Muslim Brotherhood Affiliates on 9/11." Apr. 15, 2015 update: Norquist today resigned his board membership from the National Rifle Association. According to FoxNews.com, he did so "amid allegations of ties to radical Muslims. … a month after radio host Glenn Beck told his audience that Wayne LaPierre, the executive vice president of the NRA, had initiated an investigation into Norquist for alleged ties to Islamist groups, including the Muslim Brotherhood." Beck's TheBlaze website reported that NRA board members received a notice that Norquist "voluntarily suspended his board activities pending the outcome of the investigation." Comment: Even if Norquist manages to return to the NRA board, this confirms my long-standing point that ties to Islamists is a bad career move for conservatives. Take heed, Chris Christie.